This DVD set covers marking from puppies through advanced training. 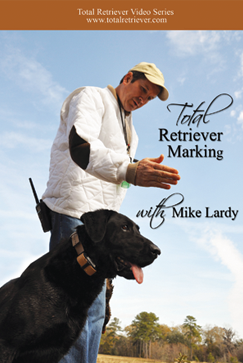 Mike uses field demonstrations and evening discussions to describe a complete sequential marking program and to explore a wide variety of marking topics. 4 DVDs set includes 5 hours of instruction and demonstrations, a comprehensive manual, s/h in U.S.
Fireside discussions with Mike Lardy expand on the marking concepts in each DVD. These discussions cover commonly asked questions from both FIELD TRIAL and HUNT TEST perspectives. A comprehensive manual includes introductory remarks, clarifying comments, definitions, diagrams and detailed information on various topics. The manual supports the dvds and details important concepts in sidebars throughout the manual.